Look at this! 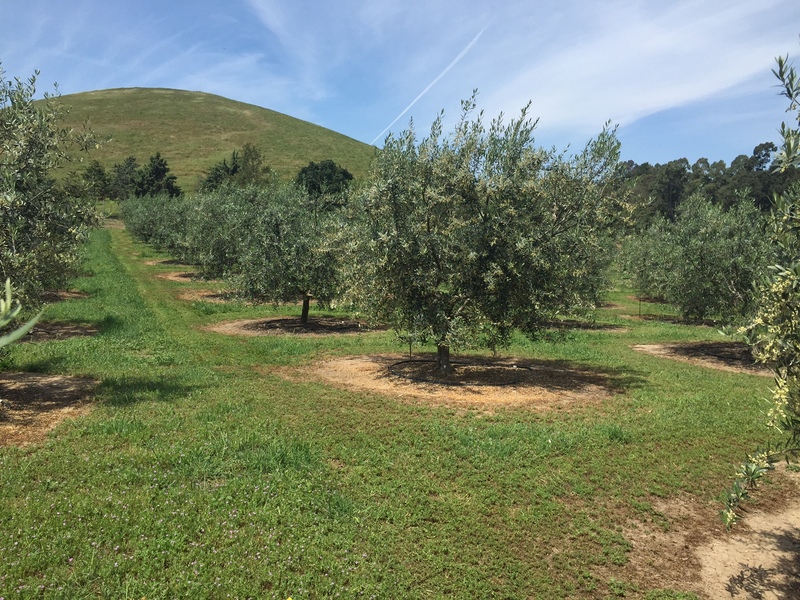 The small trees in the background were planted last October, and the big tree in the foreground was part of the 2009 planting (ignore the big eucalyptus trees in the far background). All the rest of the 2009 trees are equal in size to the one in the foreground. It’s amazing to see the size difference in just one year of growth! Those little trees will begin to grow rapidly this summer. It will take a few years to catch up, but before long we are going to have 325 really large trees! All of the trees are doing well this winter. 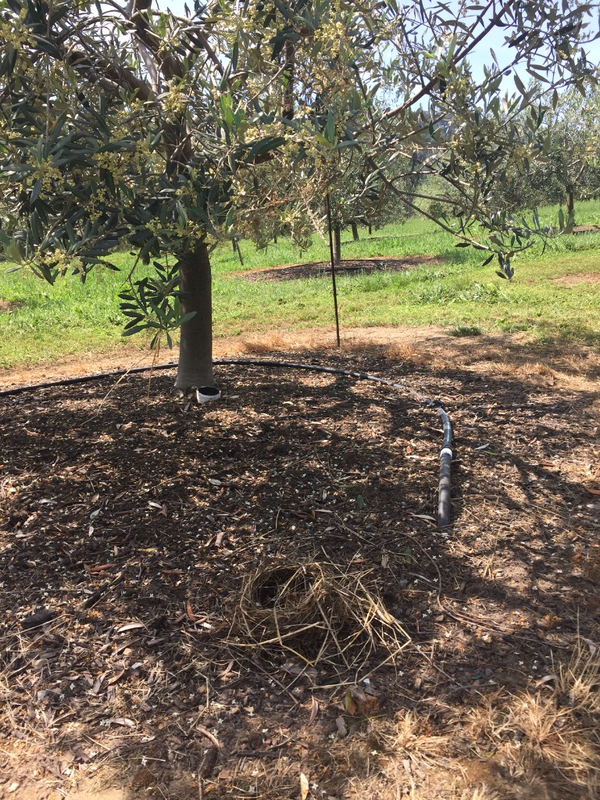 I sprayed with an organic copper application to prevent peacock spot, which can appear on olive trees and eventually harm them. A new ATV mounted sprayer was a big help. We assumed that the first pruning of the older trees would happen this winter. But my orchard consultant, Sean McEntire, advised me to let the trees grow another year. Next winter might be a busy one! I want to keep this post short, like I hope the winter will be, so I’ll save more updates for later. For now, I’m really looking forward to Spring and watching the new trees begin to grow! Getting started! Each tree variety to its new location. Sadie loving the broken water line! In the short history of D’Oliva, the biggest events thus far have been October 10, 2009, when the first 200 trees were planted … and yesterday when the last 125 trees were planted. We had a great time as about 30 friends and family spent the day digging, planting, laughing and celebrating. Under the watchful eye of my orchard consultant, Sean, and the bemused eye of my golden retriever, Sadie, all 125 trees were carefully given a new life in the orchard. Hopefully they will be there for decades – even centuries – to come. Planting a new orchard is an expression of confidence. There has to be confidence in the future to plant something that takes years to produce. Even beyond a hope in the future, it takes confidence that the soil will sustain, the rains will refresh, and the sun will nurture the trees for years to come. Yesterday was the kind of day that builds that confidence. A beautiful day of sunshine, mild weather, and great fun. Topped off by an evening of incredible food prepared by my friend Carrie and great wines chosen by my husband Roy. 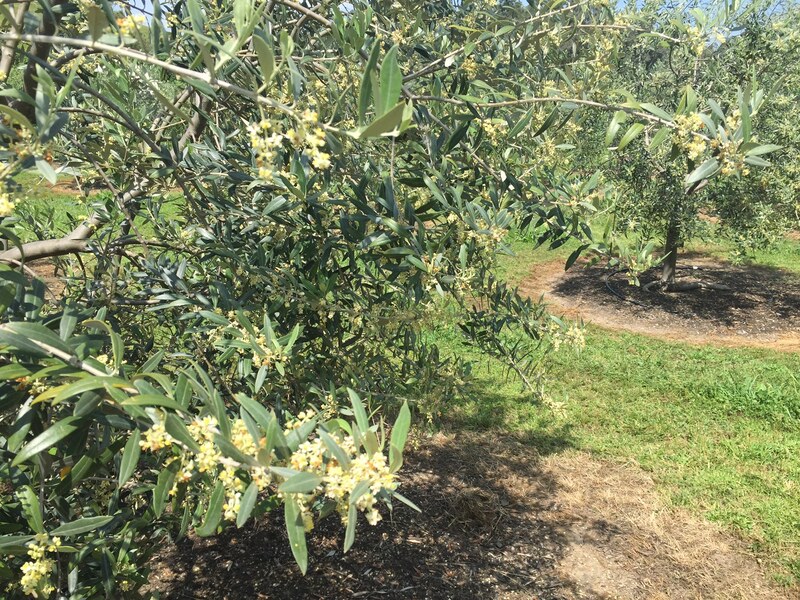 Good friends, loving family, gorgeous weather, a day in the orchard, gourmet food, delicious wine … truly a California version of la dolce vita!